Certain key elements play crucial roles in tendon transfer operations. [1, 2, 3, 4, 5, 6] Three important principles should be emphasized. First, the transfer should not significantly decrease the remaining function of the hand. Second, the transfer should not create a deformity if significant return of function occurs following a nerve repair. Third, the transfer should be phasic or capable of phase conservation. 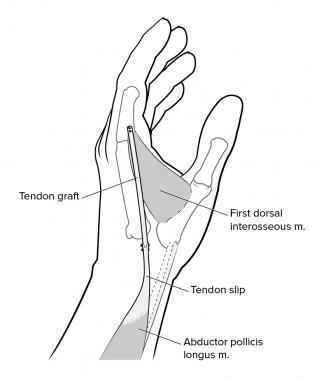 For more information on tendon transfer in the hand, see Hand, Tendon Transfers. Fundamental principles of muscle-tendon units include the following. In any patient with peripheral nerve palsy, all joints must be kept supple because soft-tissue contracture is far easier to prevent than it is to correct. Maximum passive motion of all joints must be present before a tendon transfer because no tendon transfer can move a stiff joint. The tendon chosen as a donor for transfer must be strong enough to perform its new function in its altered position. Selecting an appropriate motor is important because a muscle will lose one grade of strength following transfer. Do not transfer muscle that has been reinnervated or muscle that was paralyzed and has returned to function. In the most effective transfer, the muscle passes in a direct line from its origin to the insertion of the tendon being substituted. Although not always possible, this configuration is desirable. A single tendon cannot be expected to simultaneously perform diametrically opposing actions, eg, flex and extend the same joint. If a muscle is inserted into two tendons with separate functions, the force of amplitude of the donor tendon is dissipated and less effective than that of a muscle motored by a single tendon. The use of synergistic muscles, eg, finger flexors acting in concert with wrist extensors and finger extensors with wrist flexors, has been advocated for transfer. Muscle function is easier to retain after synergistic muscle transfer. The removal of a tendon for transfer must not result in an unacceptable loss of function. Sufficient muscle must remain to substitute for the donor muscle. No transfer should be performed until the local tissues are in optimal condition. The term often used to describe this is tissue equilibrium. Tissue is in equilibrium when soft-tissue induration has resolved, when any reaction in the wound is absent, when joints are supple, and when the scars are as soft as they are likely to become. Tendon transfers function best when passed between subcutaneous fat and the deep fascial layer; they are not likely to be functional if placed in the pathway of a scar. Although an infinite number of possible combinations for transfer of the radial nerve are available, three sets of transfers are currently considered most reasonable (see below). [8, 3, 9] For more information on radial nerve injury, see Radial Nerve Entrapment. In standard flexor carpi ulnaris (FCU) tendon transfer (see the image below), the first incision (incision 1) is directed longitudinally over the FCU in the distal half of the forearm. Its distal end is J-shaped with a transverse extension long enough to reach the palmaris longus (PL) tendon. The FCU tendon is transected from the pisiform and detached as far proximally as the incision allows. Incisions used in standard (flexor carpi ulnaris [FCU]) combination of transfers. The second incision (incision 2) begins 5 cm below the medial epicondyle and angles across the dorsum of the proximal forearm, moving directly toward the Lister tubercle. The rest of the fascial attachments to the muscle are incised. 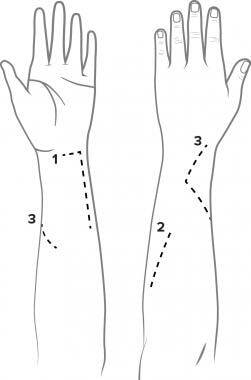 The third incision (incision 3) begins on the volar-radial aspect of the mid forearm, passes dorsally around the radial border of the forearm in the region of insertion of the pronator teres (PT) muscle, and angles back on the dorsum of the distal forearm towards the Lister tubercle. 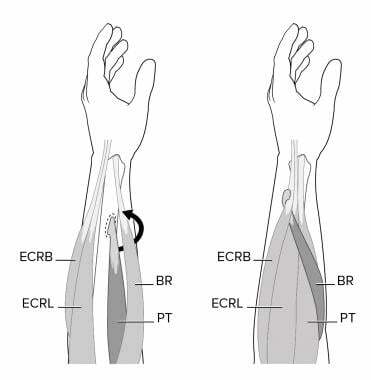 The PT muscle and tendon are passed subcutaneously around the radial border of the forearm, to be inserted into the extensor carpi radialis brevis (ECRB) muscle just distal to its musculotendinous junction. The FCU muscle is pulled into the dorsal wound. 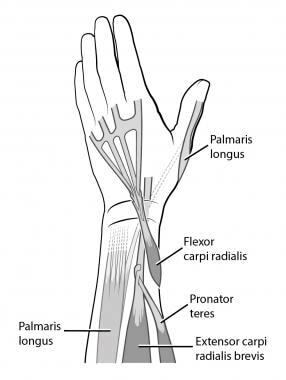 The line of pull must be as straight as possible from the medial epicondyle to the extensor digitorum communis (EDC) tendon just proximal to the dorsal retinaculum (see the image below). Pronator teres (PT) to extensor carpi radialis brevis (ECRB) transfer. Also pictured are extensor carpi radialis longus (ECRL) and brachioradialis (BR). The extensor pollicis longus (EPL) muscle is divided and rerouted toward the volar aspect. The PL tendon is transected at the wrist and detached proximally to allow a straight line of pull between the PL and EPL tendons (see the image below). The PT tendon is then sutured to the ECRB tendon. The FCU transfer is then sutured. The PL muscle is rerouted to the EPL tendon. Palmaris longus (PL) to rerouted extensor pollicis longus (EPL) transfer. To perform a transfer of the flexor digitorum superficialis (FDS), a long incision is made on the volar side of the radial aspect of the midforearm, and the tendons of the PT, extensor carpi radialis longus (ECRL), and ECRB are exposed. The PT tendon is sutured to the ECRB tendon. The FDS (or sublimis) tendons of the long finger (FDS 3) and the ring finger (FDS 4) are exposed, divided, and delivered into the forearm wound. Then, 1- to 2-cm openings are made in the interosseous membrane, and the flexor tendons are passed to the dorsum through the openings in the interosseous membrane. The FDS 3 is rerouted to the radial side of the profundus mass, and the FDS 4 is rerouted to the ulnar side of the profundus mass. Kinking of the median nerve must be carefully avoided as the muscles are passed into the opening. The FDS 4 is interwoven into the tendons of the extensor indicis proprius (EIP) and the EPL, and the FDS 3 is interwoven into the EDC tendon. Then, the flexor carpi radialis (FCR) tendon at the base of the thumb is divided and detached. The FCR is passed through the substance of the abductor pollicis longus (APL) and extensor pollicis brevis (EPB) tendons and sutured in place. First, the PT-to-ECRB transfer is performed. The FCR tendon is exposed through a longitudinal incision on the volar-radial aspect of the forearm. The tendon is divided at the wrist and redirected around the radial border of the forearm to the wrist dorsally via a subcutaneous tunnel. The finger extensor tendons are tested for extension of the metacarpophalangeal (MCP) joint and then divided. They are then withdrawn distally and sutured to the FCR. After that, the PL is rerouted to the EPL (see the image below). Flexor carpi radialis (FCR) to extensor digitorum communis (EDC) transfer. Also pictured are extensor pollicis longus (EPL), extensor carpi radialis brevis (ECRB), and pronator teres (PT). Ulnar nerve palsy results in an awkward hand with significant sensory loss and profound weakness. Signs and symptoms of ulnar nerve palsy include motor loss and sensory loss (see below). For more information on ulnar nerve injury, see Ulnar Nerve Entrapment. Loss of flexion of the proximal phalanges of the fingers occurs as a consequence of paralysis of the interossei and other intrinsic muscles. Loss of integration of MCP and interphalangeal (IP) joint flexion occurs as a result of paralysis of the lumbrical muscles to the little and ring fingers. Loss of lateral or key pinch of the thumb occurs as a consequence of paralysis of the adductor pollicis. Flattened metacarpal arch (palmar arch) and loss of hypothenar elevation occur as a result of paralysis of the opponens digiti quinti and the decreased range of flexion of the little-finger MCP joint. Loss of extrinsic power to the ulnar-innervated portion of the flexor digitorum profundus (FDP) is present with an inability to flex the distal phalanges of the ring and little fingers. Partial loss of wrist flexion occurs as a consequence of paralysis of the FCU. Precision grip is impaired. 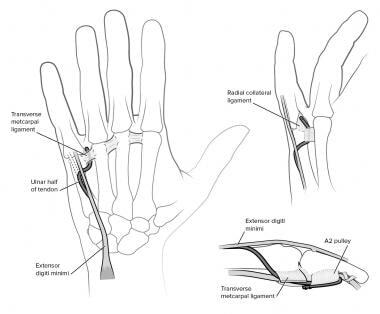 Loss of distal stability and rotation for a tip pinch between the thumb and the index finger occurs as a result of paralysis of the first and second palmar interossei and the adductor pollicis. Sensibility function is lost in ulnar nerve palsy over the volar side of the little finger and the ulnar aspect of the volar side of the ring finger. In high ulnar nerve palsy, sensibility loss occurs over the dorsoulnar aspect of the palm and the dorsal side of the little finger. In this procedure, the superficialis tendon of the ring finger is exposed. The radial slip of insertion is released proximal to the proximal IP (PIP) joint and tenodesed to prevent hyperextension of the joint after the transfer is completed. The ulnar slip is released at its terminal insertion and split into two slips. These two slips are directed volarly to the deep transverse metacarpal ligament and then dorsally to be sutured at the insertion of the central slip of the dorsal apparatus on the middle phalanx of the ring and little fingers. Traction on the transferred slips should flex the MCP joint and extend the PIP joint. When increased power of grip is desirable, a different insertion is preferred. In this circumstance, the superficialis slips are passed distally through the flexor sheaths and around the distal edge of the second annular pulley and sutured into place. With this insertion, the tendon does not extend the PIP joint, and the result is similar to dynamic transfers for proximal phalanx flexion. The radial half of the tendon is passed volar to the adductor pollicis muscle and dorsal to the FDP tendons into the insertion of the abductor pollicis brevis (APB). Traction on the transferred tendon should adduct and pronate the first metacarpal. The MCP joints of the claw fingers are placed in 45° flexion, and the PIP joints are placed in 0° extension. The first metacarpal is adducted so that it is parallel to the plane of the second metacarpal. This position is maintained in plaster immobilization for 4 weeks. Distal stability for tip pinch between the thumb and the index finger is improved by arthrodesis of the MCP joint, and this procedure is indicated when the patient develops the Jeanne sign after transfer of the FDS (see the image below). 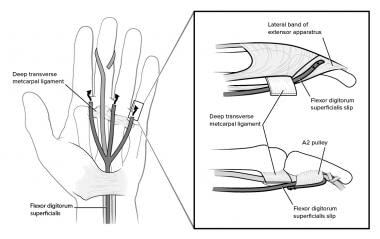 The transfer of a single FDS tendon and arthrodesis of the thumb MCP joint improves four of the six lost motor functions in a person with low distal ulnar nerve palsy. Flexor digitorum superficialis (FDS) transfer used as "internal splint" for low ulnar nerve palsy. Also pictured are flexor digitorum profundus (FDP), adductor pollicis, and abductor pollicis brevis (APB). Methods for managing other motor losses associated with ulnar nerve palsy include the following. In capsulodesis of the MCP joint, a transverse incision is made in the distal palmar crease, and a triangle is cut into the deep transverse metacarpal ligament on each side of the volar plate flap (see the image below). The volar plate flap is then advanced, inserted into the metacarpal neck, and immobilized for 6 weeks. Capsulodesis of metacarpophalangeal joint to control claw deformity. To perform dorsal tenodesis, the ECRL and extensor carpi ulnaris (ECU) muscles are exposed. Each tendon is cut at the junction of the middle and distal thirds of the muscle. The freed half of the tendon is cut distally but left attached to its insertion on the metacarpal. Each half tendon is then split once longitudinally to obtain four slips. Each slip is routed through the interosseous space and passed to the radial side of each finger. The slip passes volar to the deep transverse metacarpal ligament and inserts into the lateral band of the dorsal apparatus (see the image below). Dorsal tenodesis to control claw deformity. In FDS transfer for claw deformity, the FDS tendon is divided into four slips and passed through the lumbrical canals and volar to the deep transverse metacarpal ligament. Each slip may be inserted into the lateral band of the dorsal apparatus or into the second annular pulley of the flexor sheath (see the image below). Transfer of flexor digitorum superficialis (FDS) to control claw deformity. The best available method to increase power for grip requires adding an extra muscle-tendon unit to the power train for flexion of the proximal phalanx. Gross grip power is improved by transferring a wrist extensor or the brachioradialis to flex the MCP joint. After the ECRL is passed around the radial side of the forearm, it is extended by a free graft in two to four slips. It is then passed through the carpal tunnel and volar to the deep transverse metacarpal ligament and into the lateral band of the dorsal apparatus (see the image below). This transfer adds power to finger flexion. 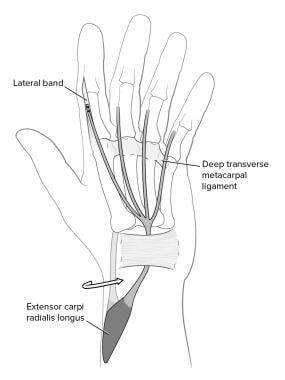 Transfer of extensor carpi radialis longus (ECRL) to control claw deformity. The brachioradialis, extended with a free tendon graft, is extended through the interspace between the third and fourth metacarpals to insert on the abductor tubercle of the thumb (see the image below). This transfer adds power to the key pinch. 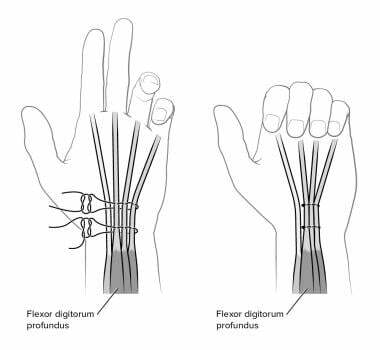 Transfer of flexor digitorum superficialis (FDS), through facial pulley, to the abductor tubercle of the thumb. The extensor digiti minimi (EDM) tendon is step-cut at its insertion, leaving a strip to be sutured to the EDC. The muscle-tendon unit is withdrawn to the wrist and passed through the forearm between the APL and the FCR. The EDM tendon is then passed subcutaneously in a diagonal course so that it can be sutured to the periosteum of the neck of the fifth metacarpal. A slip of the APL is elongated with a free tendon graft from the PL or plantaris and inserted into the tendon of the first dorsal interosseous (see the image below). Tip pinch. Slip of abductor pollicis longus (APL) is elongated with free tendon graft from palmaris longus (PL) or plantaris and inserted into tendon of first dorsal interosseous. The ulnar half of the EDM is directed volar to the deep transverse metacarpal ligament and sutured to the phalangeal attachment of the radial collateral ligament of the MCP joint of the little finger. 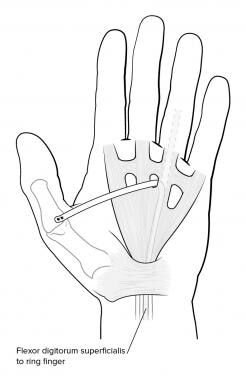 If the little finger is clawed and abducted, the tendon is inserted through the second annular pulley of the flexor sheath (see the image below). Transfer of ulnar half of extensor digiti minimi (EDM) to correct persistent abduction of little finger. Side-to-side tenodesis of the profundus tendons of the ring and little fingers to the profundus of the long finger in the forearm increases the power for gross grip (see the image below). Finger and wrist flexion. Side-to-side tenodesis of profundus tendons of ring and little fingers to profundus of long finger in forearm increases power for gross grip. In the case of high median nerve palsy or low median nerve paralysis associated with tendon injury at the level of the wrist, a proprius tendon transfer is usually the first choice. [12, 13] However, in case of a low injury at the level of the wrist with a median nerve repair, often, no opponens transfer is indicated. These patients usually regain the function of the APB in 6 months and, in the case of sharp lacerations, have good return of function in one year. The most frequently used motor for opponensplasty of the thumb is the FDS of the ring or middle finger. In the Royle technique, the motor is passed up the sheath of the flexor pollicis longus (FPL), and the split superficialis tendon is attached to the superficial head of the flexor pollicis brevis (FPB) and the opponens pollicis. The Thompson modification of this procedure uses a pulley and a more superficial location for this transfer. The distal end of the transverse carpal ligament and the ulnar border of the palmar fascia act as the pulley, and the route of the transferred FDS is subcutaneous. A dual attachment is made. The first slip of the superficialis is attached through a hole drilled in the neck of the first metacarpal, while the other is drawn over the MCP joint and sutured into the hood mechanism of the proximal phalanx. In a typical Bunnell opponensplasty, the superficialis tendon of the ring finger is removed. Another incision is made proximal to the wrist over the ulnar artery and nerve area. The FCU tendon is identified. The FCU is exposed proximal to the pisiform and divided in half, with both halves remaining attached distally to the pisiform. 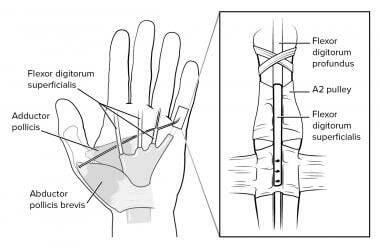 A subcutaneous tunnel is created across the palm from the thumb to the pisiform area. The FDS of the ring finger is then delivered into the wrist incision and passed subcutaneously from the pisiform to the thumb incision. The distal tip of the FCU is then sutured to the pisiform to create a fixed loop through which the FDS can easily pass. Both the Bunnell opponensplasty and the Royle-Thompson opponensplasty use bony attachments (see the image below). This can complicate the procedure of opposition transfer. If opposition transfer can duplicate the function of the APB, satisfactory function can result. Therefore, the transferred tendon is simply interwoven into the tendon of the APB. The Riordan attachment uses this interweaving into the APB tendon, but continues it distally into the hood of the thumb MCP joint and to the EPL tendon over the proximal phalanx. This larger attachment markedly increases the power of extension of the IP joint of the thumb. However, without an FPL, a hyperextension deformity can result. 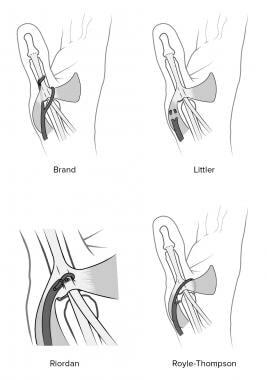 Techniques of distal attachment as described by Brand, Littler, Riordan, and Royle and Thompson. Brand's method of distal attachment interweaves one slip of the superficialis through the tendon of the APB and continues it on to the EPL. However, the other slip comes across the extensor mechanism subcutaneously and is attached to the area of the adductor pollicis (see the image above). This method creates considerable stability in the MCP joint. Proprius tendon transfers have become increasingly popular. Both the EIP and the EDM have been described for restoration of opposition. A short incision is made over the MCP joint of the index or the small finger. Another incision is made over the base of the fifth metacarpal. The EDM is brought into the more proximal incision, and a subcutaneous tunnel is created around the ulnar border of forearm across the palm to the area of the thumb MCP joint. The pulley for this transfer is the ulnar aspect of the forearm. When the EIP is used, the tendon is removed along with a small portion of the tendon hood. The defect in the hood is repaired. A larger dorsal ulnar incision is made in the distal forearm. This incision allows the surgeon to displace the tendon into the forearm on its ulnar aspect. An additional incision is made in the area of the pisiform and the thumb MCP joint. The tendon is then passed through the ulnar aspect of the wrist across to the MCP joint. The attachment is made by using Riordan's method, and again, the pulley is the ulnar aspect of the forearm (see the image below). Extensor indicis proprius (EIP) opponensplasty. In high median nerve paralysis, a lack of function occurs in the forearm and wrist pronator-flexor group, with the exception of the FCU. Absent muscles include all of the FDS, the two radial profundi, and the FPL. In considering extrinsic replacement, it is essential to determine which functions need to be replaced. The flexor power in the long and index fingers, the range of motion (ROM) in the index finger, and the ROM and power in the IP joint of the thumb are desired. Only two or three muscle-tendon units are truly available for transfer. In high median nerve palsy, the brachioradialis and the ECRL are available. An alternative to direct transfer for restoration of the extrinsic function is side-to-side suturing of the FDPs of the ring and small fingers, which are ulnarly innervated, to the denervated portions on the radial side. The use of suturing the ECRL to the FDP of the index and long fingers is reserved for those patients who need radial side power and are unlikely to obtain significant reinnervation following neurorrhaphy (see the image below). 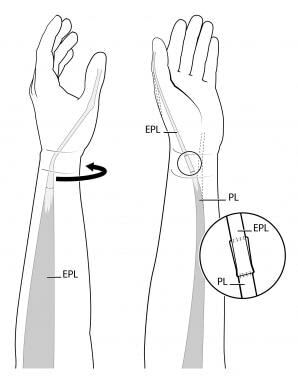 In order to perform a tendon transfer of new motors to the index finger or to the index and long fingers and thumb, the wrist must have a full ROM. Similarly, the use of the brachioradialis to the FPL requires full ROM in the wrist. 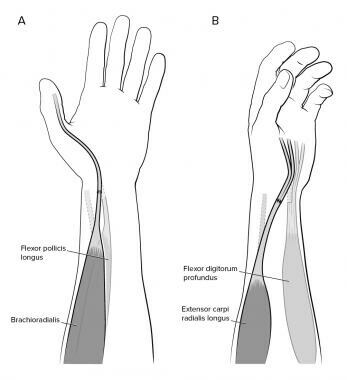 Extrinsic replacement using brachioradialis to flexor pollicis longus (FPL) (A) and extensor carpi radialis longus (ECRL) to the profundi of index and long fingers (B). In both situations, transfers as shown are end-to-end. If patient has any chance of extrinsic return following grafting, transfer should be end-to-side. End-to-end technique shown here is used in patients with no chance of extrinsic return. Gascoigne AC, Flood S. Tendon transfers. Farhadieh RD, Bulstrode NW, Cugno S, eds. Plastic and Reconstructive Surgery: Approaches and Techniques. Chichester, United Kingdom: John Wiley & Sons; 2015. 733-51. Cohen M. Tendon transfers. Mastery of Plastic and Reconstructive Surgery. Boston: Little Brown; 1994. Vol 1: 1579-97. Seiler JG 3rd, Desai MJ, Payne SH. Tendon transfers for radial, median, and ulnar nerve palsy. J Am Acad Orthop Surg. 2013 Nov. 21 (11):675-84. [Medline]. Giuffre JL, Bishop AT, Spinner RJ, Shin AY. The best of tendon and nerve transfers in the upper extremity. Plast Reconstr Surg. 2015 Mar. 135 (3):617e-630e. [Medline]. McCarthy JG, May JW, Littler JW. Plastic Surgery: The Hand, Part 2. Philadelphia: WB Saunders; 1989. Vol 8: 4923-65. Davis TRC. Principles of tendon transfers of median, radial, and ulnar nerves. Wolfe SW, Hotchkiss RN, Pederson WC, Kozin SH, Cohen MS, eds. Green's Operative Hand Surgery. 7th ed. Philadelphia: Elsevier; 2017. Vol 2: 1023-79. Wilbur D, Hammert WC. Principles of Tendon Transfer. Hand Clin. 2016 Aug. 32 (3):283-9. [Medline]. Jones NF, Machado GR. Tendon transfers for radial, median, and ulnar nerve injuries: current surgical techniques. Clin Plast Surg. 2011 Oct. 38 (4):621-42. [Medline]. Cook S, Gaston RG, Lourie GM. Ulnar Nerve Tendon Transfers for Pinch. Hand Clin. 2016 Aug. 32 (3):369-76. [Medline]. Sridhar K. Tendon transfer for median nerve palsy. Indian J Plast Surg. 2011 May. 44 (2):357-61. [Medline]. [Full Text].